See below to find out when PROSTAID Calgary/PCCN Calgary's next meetings are and what main topic will be covered. Our meetings are held at the Kerby Centre downtown. The parking in the lot beside the C-Train stop is free, but you must register your vehicle's license plate on the tablet at the front desk inside (on the second floor). Please do not forget to register or you will be ticketed. Always the second Tuesday of every month! 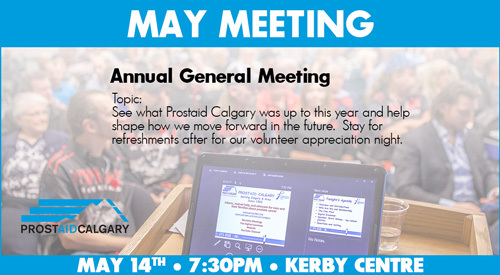 Topic & Speaker: This month is our Annual General Meeting, so be here to help shape Prostaid Calgary for now and the future. Stay after for refreshments for our volunteer appreciation night. What: Main topic led by a public speaker, followed by member interaction. Partners are always welcome! All meetings are free and refreshments are served before and after the 7:30 meeting. Where: Lecture Room (Room 205), Kerby Centre, 1133 - 7th Ave. SW, T2P 1B2. Map. Why: To discuss new topics about prostate cancer, network with fellow survivors and ask plenty of questions. What: For those men and their families dealing with advanced prostate cancer. The Warriors are a caring and compassionate group, well organized and full of information. Frank Altin, facilitator. Where: Boardroom (Room 208), Kerby Centre, 1133 - 7th Ave. SW, T2P 1B2. Map. Why: To discuss new topics pertaining to the advanced stages of prostate cancer along with fellow survivors in the advanced stages of the disease and treatments. Topic & Speaker: To be announced. What: Prostate Cancer is a couples disease and Caregivers experience similar emotional distress as our men. Sharing our journey with people who understand exactly what we are going through helps relieve our fears and worries. We hope you will join us. Where: Room 311, Kerby Centre, 1133 - 7th Ave. SW, T2P 1B2. Map. Why: To allow wives and partners of those affected with prostate cancer to have our own private discussions about the disease, our loved ones and our relationships. For more on meetings in general, click here.